Whisk together pumpkin, sugar, milk, spices, salt, and eggs. Pour into a greased 9”x13” pan. Sprinkle cake mix over the top. Scatter pecans over cake mix and pat down very lightly. Get more recipes from The Cove kitchen. Enjoy delicious recipes like this on your next stay at The Cove. See a full list of upcoming events at The Cove, or contact our Guest Group department to hold your group retreat at The Cove. Grease a 13”x9”x2” baking pan. In a mixing bowl, cream butter and sugars until light and fluffy. Beat in evaporated milk and vanilla. Mix in dry ingredients on low speed, just until blended. Stir in chocolate chips, butterscotch chips, and chopped nuts. Spread batter in prepared pan and bake for about 25 minutes, or until golden brown and a toothpick comes out almost clean. The general rule of thumb for grilling salmon is to grill it for 10 minutes per inch of filet. Heat first 3 ingredients over low-medium heat for 3-4 mins. Add 1 cup heavy cream, bring to boil, then turn down to simmer until thickened. Season with salt. Serve under salmon filet. Place trimmed asparagus on baking sheet. Mix ingredients well to coat asparagus. Place in 375 degree oven and bake for 10 minutes. Just before removing your salmon from the grill, throw asparagus on the grill for a minute or two. Sauté tomatoes for 2-3 minute in a pan over medium-high heat. Top off this dish with grilled lemon slices and fresh dill! Enjoy delicious recipes like this on your next stay at The Cove. See a full list of upcoming events at The Cove or contact our Guest Group department to hold your group retreat at The Cove. Blueberry season is upon us! Go grab your buckets and pick some of those deliciously sun kissed berries for this summer dessert served at The Cove. Let us know how yours turns out! Whisk together flour, light brown sugar, sugar, baking powder, salt, and lemon zest in a bowl. 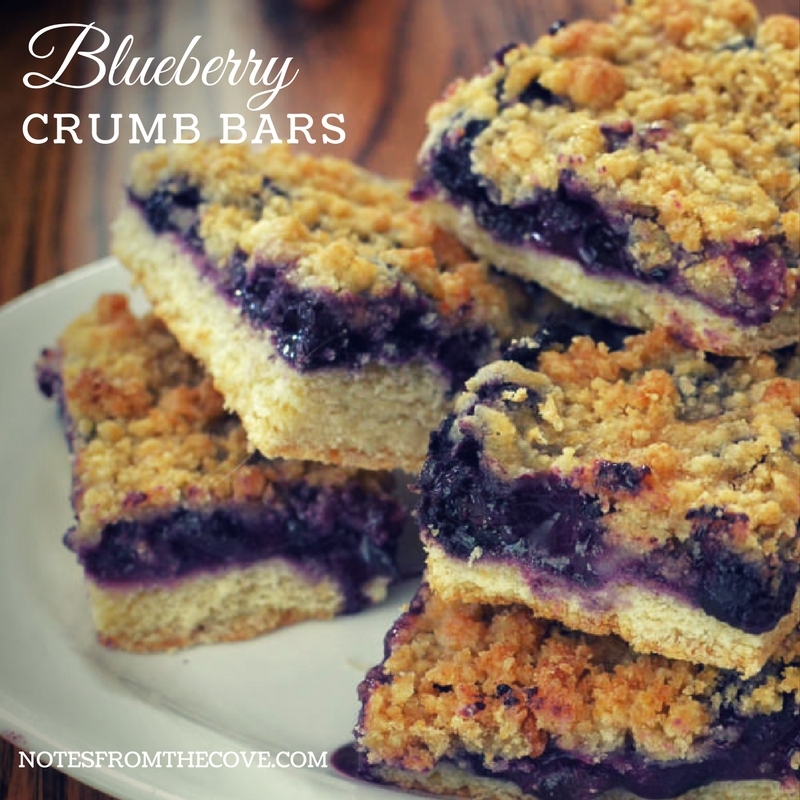 Cut in butter in small amounts until mixture forms into small crumbs. Stir in vanilla extract and egg. Press HALF of crumb mixture into the bottom of a greased 9”x13” pan. Toss all filling ingredients together in a separate bowl and spread over crust. Sprinkle remaining crumble mixture over top of blueberry filling. Bake at 375 degrees for 45-60 minutes until golden brown. Remove from oven and let cool before serving. Enjoy delicious recipes like this on your next stay at The Cove. Click here to see a full list of upcoming events at The Cove or contact our Guest Group department to hold your group retreat at The Cove. 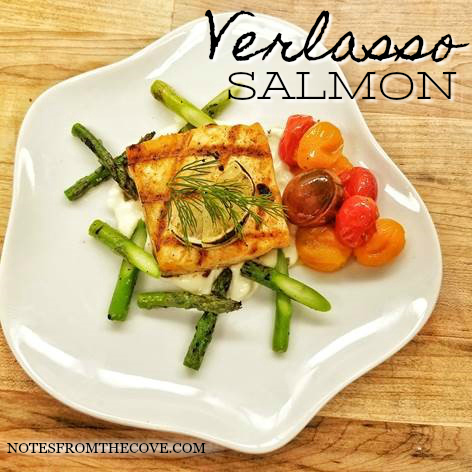 For more Cove recipes, click here. 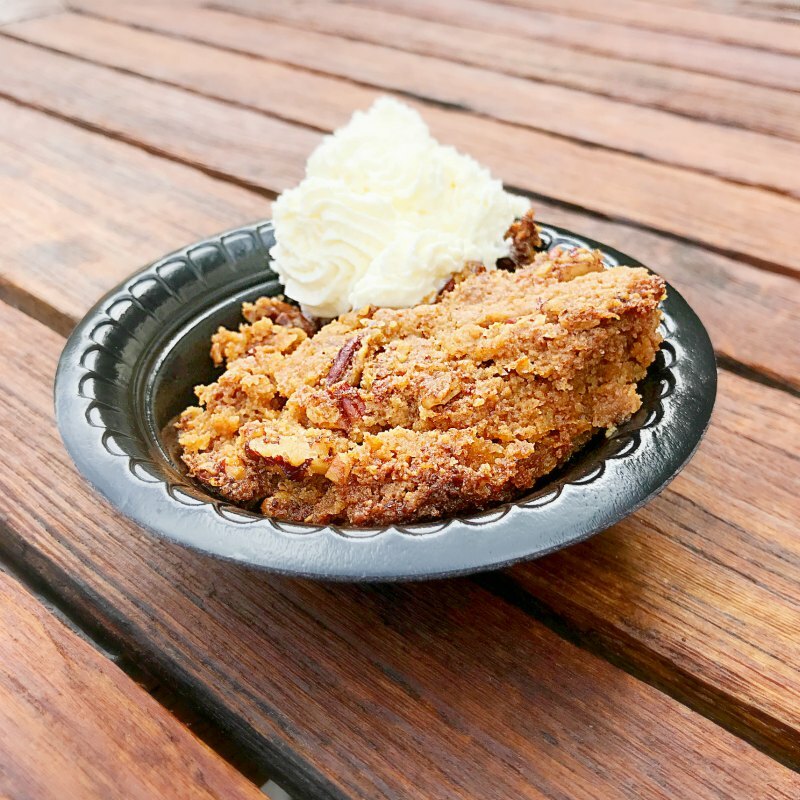 There is no pie more southern than pecan pie, and this one from our kitchen at The Cove is delightful! Whip it up for your next family or social gathering and it’s sure to be a big hit. Blend butter and flour together until mixture becomes creamy. Blend sugar into butter/flour mixture. Once combined, beat in eggs, one at a time. Add corn syrup, vanilla and salt to filling. Then stir in one cup chopped pecans. Place pie crust into a 9” round baking dish and pour mixture into pie crust. Add extra pecans for topping. Bake in oven at 300 degrees until set, about 1-1.5 hours. Allow pie to cool to room temperature. Find more recipes from The Cove kitchen. Enjoy delicious recipes like this on your next stay at The Cove. See a full list of upcoming events, or contact our Guest Group department to hold your group retreat at The Cove. 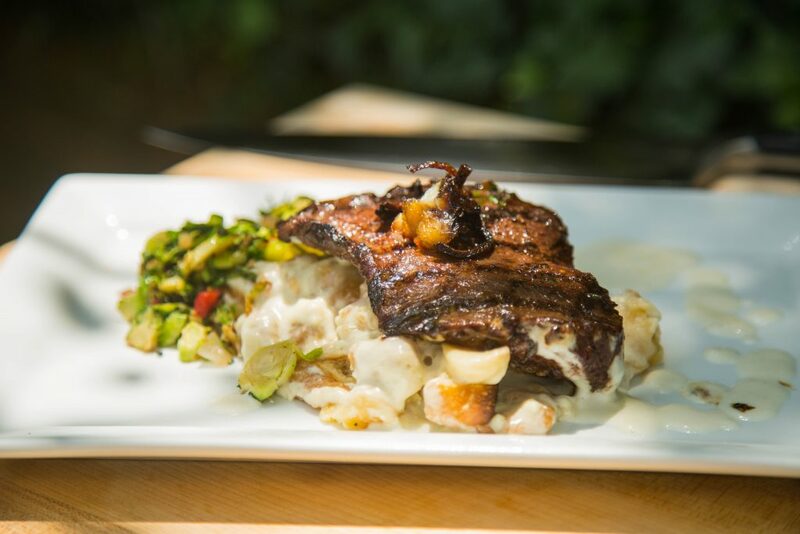 This delicious dish is a guest favorite at The Cove. It’s much simpler than it looks, so give it a try and let us know how it turns out! Season steak with salt and pepper. Grill for 3-5 minutes on each side over medium high heat. Remove from heat, brush with melted butter and let rest for 5 minutes. Dice bread into small squares (crouton size) and place in a 9″ x 13” greased pan. Bake bread for 10 minutes at 350 degrees. Add blue cheese sauce (see directions below). Toss to coat bread well with sauce. Bake for 25 minutes at 350 degrees. Melt butter in a sauce pan over medium heat. Add chopped shallot and minced garlic. Saute one minute and add beef stock and heavy cream, and bring to a boil. Add blue cheese crumbles and Parmesan cheese. Reduce heat for 2-3 more minutes until cheese is melted. Add chopped fresh parsley and season with salt and pepper to taste. 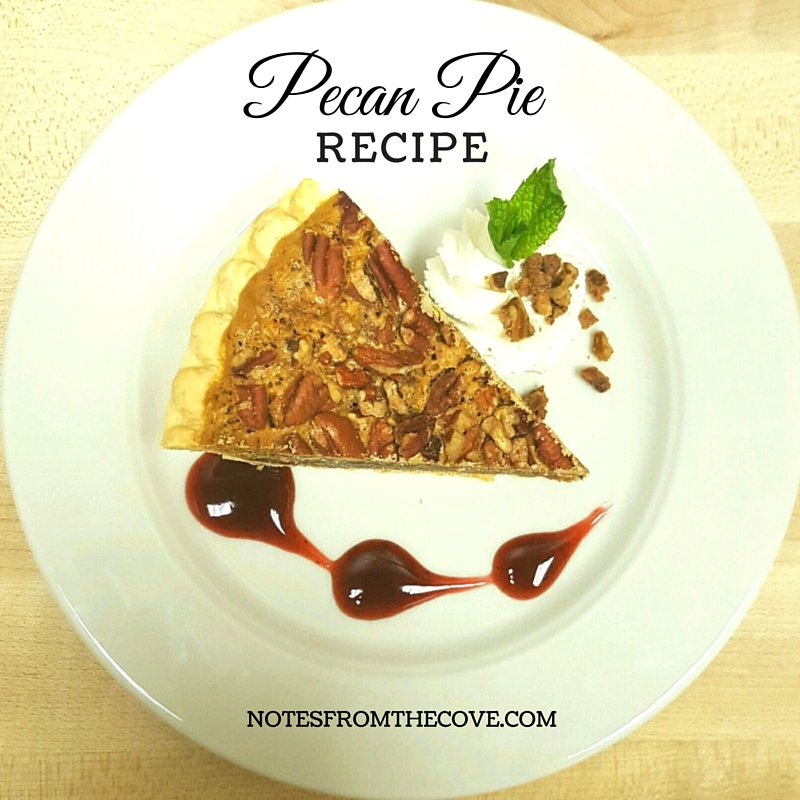 Today, our pastry chef, Natalie, shares another delicious recipe that has become a guest favorite here at The Cove. Enjoy this delectable Dark Chocolate Truffle Cake and come back and let us know how it turns out in the comment section below! Preheat oven to 350°. Melt semi-sweet chocolate chips and butter in pan over medium heat. Remove from heat. Stir in sugar, salt, and both vanilla and coffee extracts to melted chocolate and butter. Once mixed, add the eggs, beating briefly until smooth. Add cocoa powder and mix until just combined. Bake in greased 8” cake pan for 25 minutes. Remove from oven and cool completely. Heat cream to a boil in sauce pan over medium heat. Remove from heat and pour heated cream over chocolate chips in a glass bowl. Let stand for 1-2 minutes, then whisk together until chocolate chips are melted and mixture is smooth. Spread Glaze over cooled cake. Tap cake pan a couple of times on counter to spread evenly over cake. Freeze cake overnight. Remove from freezer and from cake pan and thaw just until no longer frozen and serve. 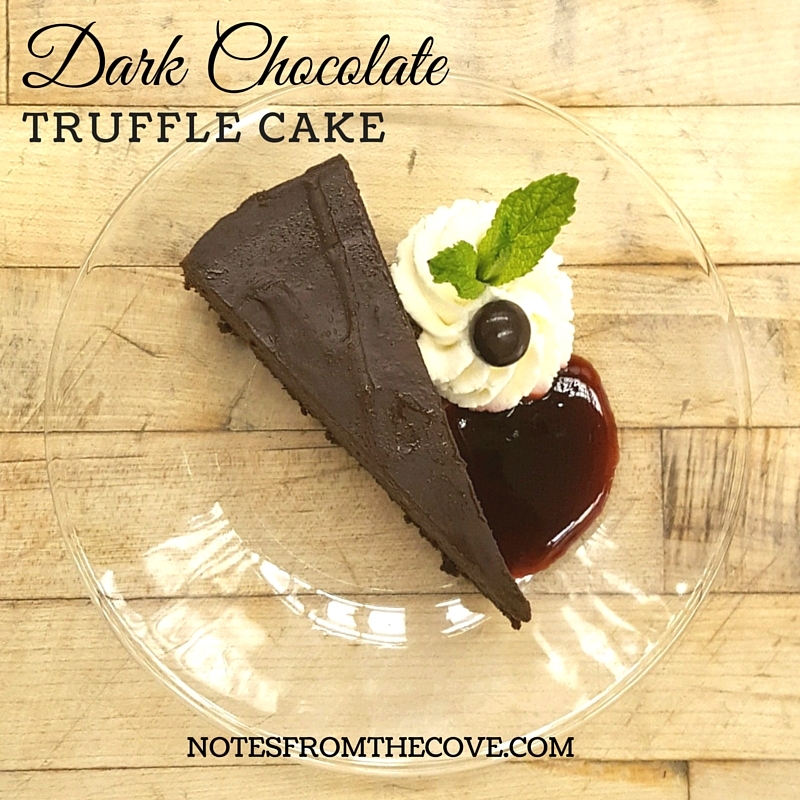 GET A PRINTABLE VERSION OF THE DARK CHOCOLATE TRUFFLE CAKE RECIPE. Find other recipes from The Cove kitchen. 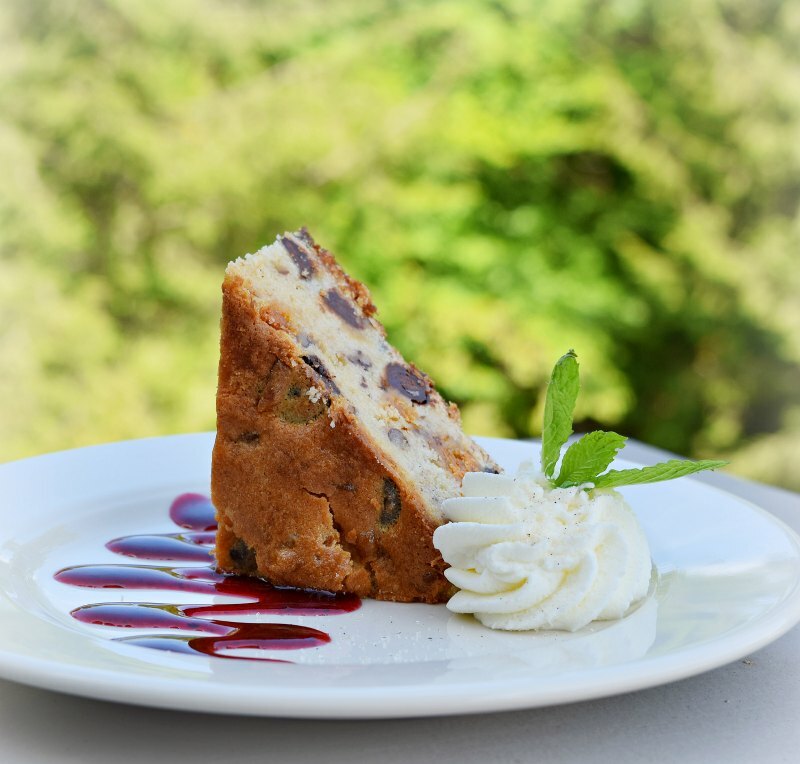 Enjoy delicious recipes like this on your next stay at The Cove. See a full list of upcoming events or contact our Guest Group department to hold your group retreat here. This creamy and satisfying side dish is a guest favorite here at The Cove! Risotto is very versatile, and goes well with lots of different dishes. Add in wilted spinach, cherry tomatoes, pesto, or cooked crab meat for a more creative dish! 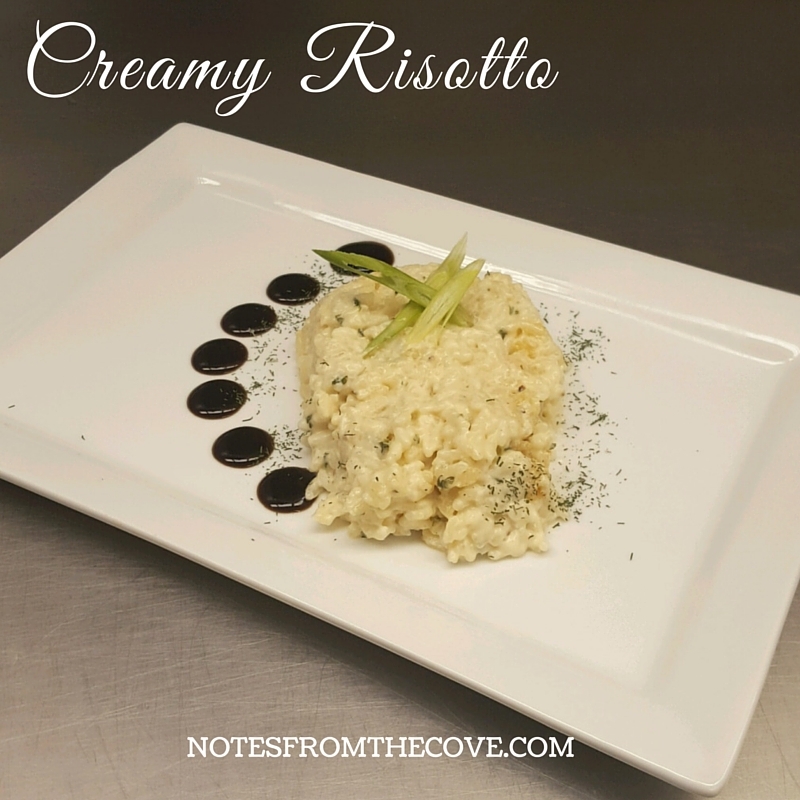 Risotto is paired well with chicken or steak and is delicious with asparagus. We have a free printable version of the recipe found at the bottom of this post. Melt butter in a medium skillet over low/medium heat. Add garlic and shallot and sauté for 2-3 minutes. Add Arborio rice and sauté for an additional 3-4 minutes or until shallots are tender. Pour in chicken stock (or water) and bring to a boil and simmer on medium heat. Do not cover and stir occasionally. Continue to add stock (or water, as needed) as rice cooks until it becomes tender and liquid begins to absorb. This can take 10-20 monutes. Stir in heavy cream and Parmesan cheese once rice is cooked. Incorporate salt and pepper to taste. Enjoy! Let us know how you like it! To find additional recipes from The Cove kitchen click here. Enjoy delicious recipes like this on your next stay at The Cove. Click here to see a full list of upcoming events at The Cove or contact our Guest Group department to book a group retreat. 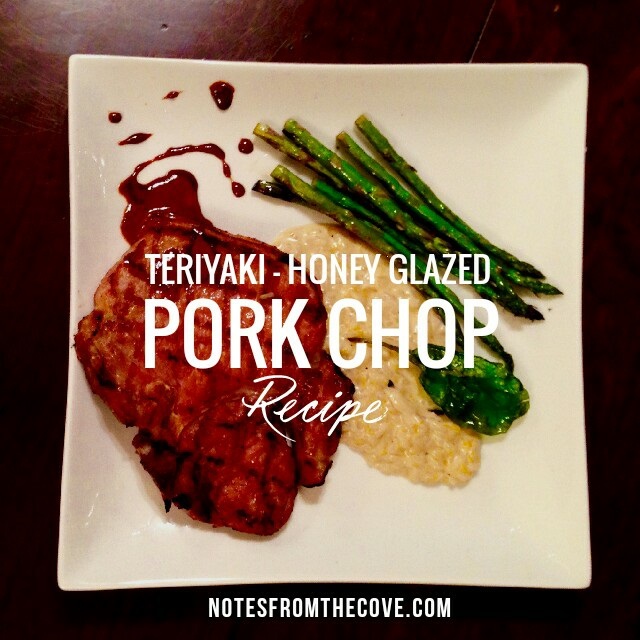 Smooth, sweet, and salty flavors are joined together in this Grilled Pork Chop with Teriyaki-Honey Glaze dish. It is a perfect combination and will be sure to satisfy your taste buds. This dish is a great meal to serve on a chilly evening and will remind you of warm summer nights. From The Cove dining room to your own home table, this recipe is bound to be a hit. Marinade pork chop in soy sauce, water, ginger, garlic, and scallions for two hours. Remove from marinade and pat dry with paper towel. Save marinade and bring to a boil in a sauce pan. Once it comes to a boil, reduce heat to a simmer and cook down for 15 minutes. Incorporate honey and light brown sugar in saucepan. Remove from heat once sugar is dissolved. Grill pork chops 12-15 minutes at a medium temperature, turning meat over halfway through. Drizzle teriyaki glaze over pork chops and serve immediately. We suggest serving with Roasted Butternut Squash Risotto and Lemon Garlic Roasted Asparagus (recipes on printable recipe PDF). Did you know that Cove Executive Director, Will Graham’s, favorite Cove dessert is banana pudding? Well, our pastry chef, Natalie, is sharing her delicious recipe today. We hope you will enjoy as much as Will and our guests do. Whip the heavy cream and powdered sugar into soft peaks. In a separate bowl, whisk together the whole milk, condensed milk, lemon juice and vanilla extract. Slowly whisk in the pudding mix and continue whisking for 2 minutes. Fold the whipped cream into the pudding mixture 1/3 portions at a time. In the bottom of a 9”x9” casserole dish, spread an even layer of vanilla wafers. Spread sliced bananas on top of wafers. Spread half of pudding mixture over the bananas. Repeat wafers, bananas, and pudding. Top with sweetened whipped cream. For best results, make 1 day ahead of time and chill overnight. 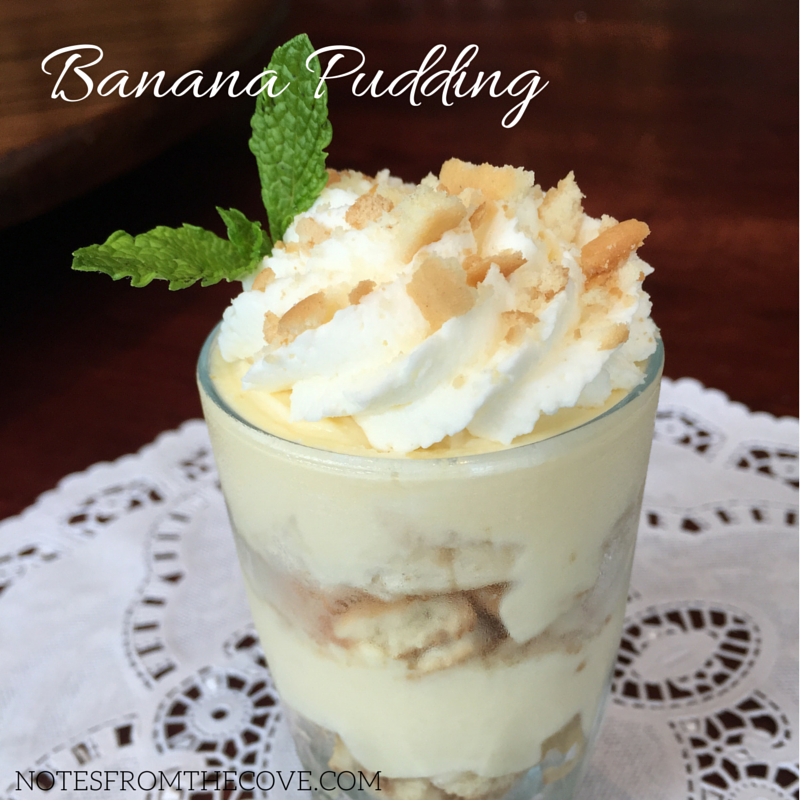 CLICK HERE FOR PRINTABLE BANANA PUDDING RECIPE.